‌In perhaps his most important book, the Dalai Lama shares his hopeful yet realistic views on how humanity must step into the future. In our daily lives today no one is untouched by what happens in the rest of the world. New technology, environmental problems, economic gain and loss, nuclear weapons, and instant communication have all created unprecedented familiarity among the world's many cultures. With this historic development, the Dalai Lama understands that the essential task of humanity in the twenty-first century is to cultivate peaceful coexistence. Many believe in the inevitability of an escalating “clash of civilizations”. Peaceful coexistence has long been problematic between religions, and while previous conflicts over religious differences may have been significant and regrettable, they did not threaten the very survival of humanity. Now, when extremists can persuade followers with the immense emotional power of faith and have access to powerful technological resources, a single spark could ignite a powder keg of frightening proportions. Yet the Dalai Lama shows how the challenges of globalization can also move us in another direction, to a deeper plane where nations, cultures, and individuals connect through their shared human nature. All major religions confront the same perennial questions; each have distinct forms of expression. But this marvelous diversity of insight has the potential for inspiring dialogue which can enrich everyone’s pursuit of wisdom. 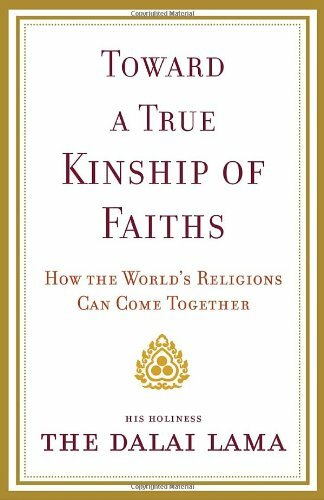 In Toward a True Kinship of Faiths, the Dalai Lama also explores where differences between religions can be genuinely appreciated instead of becoming sources of conflict. Creating genuine harmony does not depend on accepting that all religions are fundamentally the same or that they lead to the same place. Many fear that recognizing the value of another faith is incompatible with having devotion to the truth of one’s own. Nevertheless, the Dalai Lama shows how a sincere believer can, with integrity, be a pluralist in relation to other religions without compromising commitment to the essence of the doctrinal teachings of their own faith. An issue of central importance for the Dalai Lama personally and for the entire world in general, Toward a True Kinship of Faiths offers a hopeful yet realistic look at how humanity must step into the future.